The Gator Cases GPA-712SM, small format 12” speaker cabinet transporter bag is the perfect solution to moving heavy speakers from gig to gig. The heavy-duty tow handle and wheels eliminates the need to lift and carry the speakers. The large speaker compartment has a dual zippered design that allows the bag to completely open for inserting the speaker easily. The rolling speaker bag also features a foam structure in the bottom of the bag to support the speaker, rugged nylon exterior with 10mm side foam padding for extra protection against scratches and dings, two nylon side carry handles as well as a top lifting nylon handle, and a large outer accessory pocket for cables and other accessories. 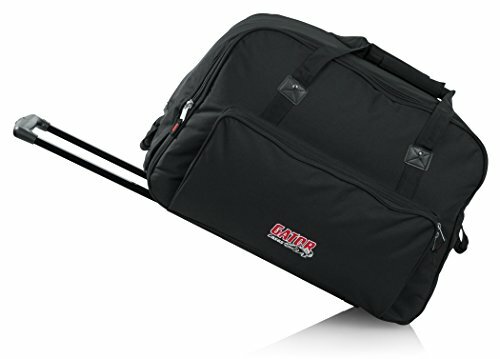 The GPA-712SM rolling speaker bag for 12” speakers has an interior dimension of Length: 24” Width: 16” Depth: 14.25”. The GPA-712SM rolling speaker bag will fit popular models of speakers including the QSC K12, Mackie TH-12A, JBL PRX612M, JRX112M, SRX712M, EON210P, EON510, Behringer B2120, and many other popular models by JBL, Yamaha, QSC, American Audio, and Yorkville.